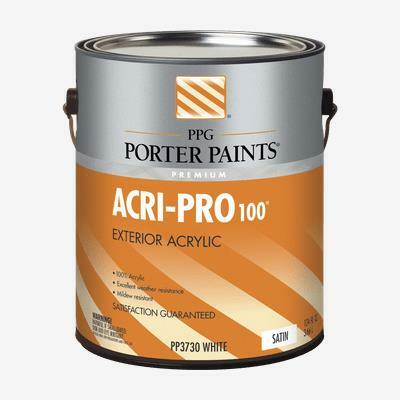 ACRI-PRO® 100 Acrylic Interior/Exterior Primer is an interior/exterior acrylic primer for properly prepared bare wood, concrete, masonry, stucco, alkyd and latex paints, and galvanized metal. It is an ideal companion to the ACRI-PRO® line of exterior acrylic finishes. ACRI-PRO® 100 Acrylic Primer is used for all types of new or previously painted commercial, institutional and residential exterior wood surfaces such as siding, trim, eaves, fascias, shutters, fences, etc., and interior woodwork, drywall, masonry, and as a primer under wallcovering. *This paint contains agents which inhibit the growth of mildew and algae on the surface of the dry paint film.